The Best Time to Ski Japan - Honshu Vs Hokkaido. One of the hardest things about planning a ski vacation is deciding on when to go. It’s always hard to predict when the best snow will fall at each ski resort (and of course, we’re at the mercy of the weather gods), however, here’s a guide to help choose the best time to head to Japan for your next Winter ski holiday. When thinking of skiing in Japan, it’s often the choice of which island – the main island of Honshu, or the smaller island of Hokkaido located up North. Both have incredible skiing opportunities, with challenging slopes, traditional villages, and copious amounts of that famous Japanese powder snow. Due to their location, Honshu and Hokkaido ski resorts also have varying seasons, some starting earlier and some lasting through until April. When to travel? Peak season for almost all resorts in Japan are over Christmas and New Years Eve, during Chinese New Year, and the Fire Festival in Nozawa Onsen (January 15th each year). Prices are much higher of these dates, as well as the number of people on the slopes, so it can be more crowded – restaurants, bars, shuttle buses, and of course, lift lines and slopes. January is the most popular time to visit Japan ski resorts due to work and school holiday breaks for those in Australia. Many resort offer Spring passes and deals to encourage travellers later in the season, and you’ll find many more lodging options available to suit your needs over these dates. Travelling in March and April also means you may see the wondrous Cherry Blossoms, more bluebird days, superb après ski, and exceptional mountain views. The main island of Japan, Honshu is home to some of Japan’s major ski resorts, including Shiga Kogen, Hakuba, Myoko Kogen, Madarao, and Nozawa Onsen. Many of the popular resorts are located in the Niigata and Nagano prefectures, which are renowned for their exceptional snowfall. Being close to the Sea of Japan (only 25km away), these areas receive mammoth amounts of light and dry powder (up to 16 metres a season!) as the moisture is drawn up over the mountain ranges and condenses into snow atop the ski resorts. Best time to travel? Start of January through to the end of February for the best powder snow conditions. Spring skiing from the start of March is also a fun-time to visit the resorts with low crowds and great deals on accommodation, however, some of the tour operators including airport transfers only offer limited services during this time. Travel in December is hit and miss and snow cover varies considerably each season. 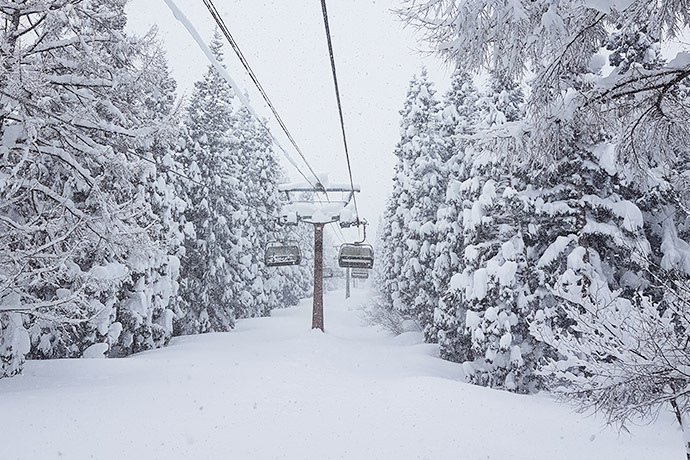 This northern island of Japan is world renowned for its incredible dry powder snow, especially at the major resorts like Niseko, Furano, Kiroro, Rusutsu and Tomamu. The cold Siberian winds cross the Sea of Japan from the North-West/West to Hokkaido, where the uplift of the mountains brings the moisture to the resorts, subsequently dumping copious amounts of fresh snow. The Japanese Alps are particularly well shaped to enhance the updraft of moisture and clouds, hence why we see amazing snowfall records in Japan each season. Best time to travel? Hokkaido is known for having a good early start to the season, with snowfall often in December creating the start of a good snowpack. Generally, powder days come with more frequency from early January until the end of February and then hit sporadically throughout March. There will be weeks where you don't see the sunshine or mountains around you as it just doesn't stop snowing and temperatures can be very cold. Many resorts still receive powder days well into April. It’s not uncommon to see Spring-like conditions early in the season, then excess snowfall in Spring. Overall, snowfall patterns are becoming less and less predictable with the change in global weather. At the end of the day it really does come down to luck - we've arrived at resorts where it's been dumping with snow for weeks, but a warm spell melts away our powder dreams, and equally turned up to resorts where there's more grass than snow only to ski powder the next day. Let us know if you need futher advice, however if you want a really accurate prediction of "what will the snow be like at... in..." you will have to ask Ullr (the god of snow) - we simply cannot answer for him. Send us an email or check out our Guide to Skiing in Japan.